The population of India is the second largest in the world (China being the largest), currently at 1.21 billion people. This is about one sixth of the world's population. Despite occupying just 2.4% of the world's land area, India supports over 17.31% of the world population. The average number of children born to one woman is 2.72 with a population growth rate of 1.548% (est.) for 2009. Life expectancy stands at 69, with averages of 72.6 in women and 67.5 in men. Due to its vast areas of arable land, the majority of the Indian population live in rural areas, with 72.2% living among the 638,000 villages, leaving 27.8% residing in towns. Expected growth of the Indian population - It is estimated that by 2020 India's population will have grown to 1.331 billion people, and by 2030 it will have overtaken the population of China. 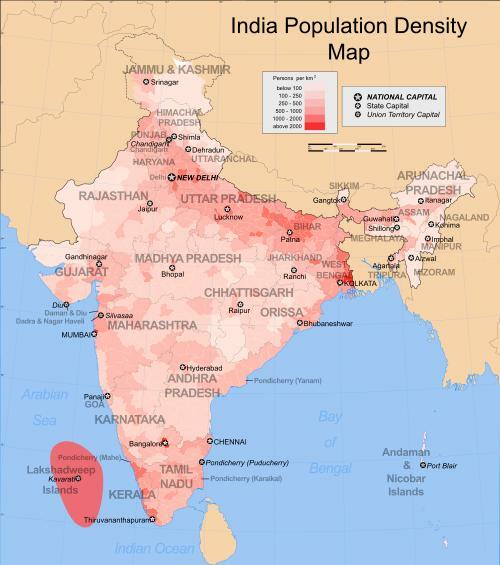 The map above shows India's popuation density - it is interesting to observe the band of high density that surrounds the Ganges river as it flows east to west in India's north. Proportionally, New Delhi will feel most crowded, with 9,340 people living per square kilometre, and least crowded in Arunachal Pradesh, with only 17 per sq.km. In the holiday destinations of Goa and Kerala the numbers are 394 and 859 respectively. India can feel very crowded, especially in the cities. For peace and solitude, why not consider escaping for a break in the remote hill stations of Kerala and Tamil Nadu.